Your child’s school can participate in an exciting program that encourages students in grades K through 6 to read for fun. 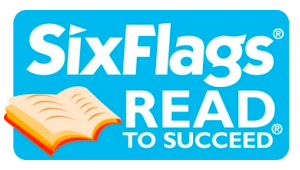 Read to Succeed is a free program sponsored by Six Flags Theme Parks. Every student who completes six hours of recreational reading before the school’s deadline listed on the bottom of this page is eligible for a free admission ticket, valid at Six Flags Great America. • Only students in grades K through 6 are eligible to participate. • Download/print the reading log. Your child will use this reading log to record what and how long he/she reads. • Your child must complete 6 hours, or 360 minutes, of recreational reading. • Please initial each entry and then sign the reading log to verify that the 6 hours, or 360 minutes, of reading has been completed. • Your child can read books, magazines, newspapers, or comic books (digital or hard copy). Reading for homework or a class assignment does NOT count. • Students can read silently, aloud, or with an adult—you can read to your child, or your child can read to you. • Remind your child to return the reading log to his/her teacher by TUESDAY, FEBRUARY 26. Your child’s school will submit your child’s information and hours read. • Late entries will NOT be accepted. • Tickets will be awarded to students by their teacher/school coordinator in May. Please make sure your child’s teacher has awarded the ticket to your child by the end of the school year. • The ticket is valid for admission on SELECT DATES ONLY during the 2019 season. Park name and valid dates will be printed on the tickets. The ticket will only be valid for the park that is listed on the ticket. The valid dates will not be announced prior to the ticket award date in early May. • Tickets are valid for students in grades K-6 only and are not valid for anyone over the age of 13. No exceptions. • Each ticket is valid for one free student admission only. • A Season Pass upgrade offer will be available during the ticket valid dates. The upgrade offer information will be printed on the ticket. • Tickets are NOT for resale and are nontransferable. • They cannot be replaced if lost, stolen or damaged. We hope that you and your child enjoy this free program and spend time reading together. If you have any questions about the program or have ticket questions, please contact Andrea Hall at andreahall309@gmail.com.